...plus Kai, Solid, 82christos and maybe another player from  clan. Kinda Offtopic: Anax has in charge some good ATDM server located in the NL, I'm sure some good ATDM action will happen there. I'm going to make 1 or 2 topics soon about tickrates and gametypes. Currently right now the server is 40 tick and using Anna101, but that's all I'll say about that here, I will leave technical details for later within the thread(s) i'll make. They will be POLLS and include relevant info so everyone can make an informed vote on both, including those who already understand this stuff. If anyone wants the games to happen on my server, just say yes or no in here, I guess. I don't want to spam the forum with 3 active threads! although the spambots do a good job of that already but meh. There's also the option of FGS for 0-aug portion of the event if it happens, Sev could host ATDM if more players from USA, Canada, S America will step up to the table. I have things I need to do so I can't play, but maybe the next games I might join. If people are willing to play ATDM, I can also start an ATDM server. There is soo few traffic these days that it's no problem to run 3 servers on the FGS host at a time. Is there a specific day and time yet for this? And how about making it a weekly thing? A!BSolid wrote: I have things I need to do so I can't play, but maybe the next games I might join. Nobody wrote: If people are willing to play ATDM, I can also start an ATDM server. Hmm, interesting, that's something we could discuss up but we already got Heys and Anaxs servers... maybe some players would like to have an extra server for another kind of gametype as BTDM or smth... we'd have to see what other players say. Atrey wrote: Is there a specific day and time yet for this? Not yet, we are still seeing how many players would be up for this, so far number of implicated fellows is bigger than I expected xD. That's my main purpose with the Discord group and so, there are more players joining it up and those past days (especially yesterday) we had some games with up to like 6-7 players... I think that if we all cooperate it could be a reality soon to have decent games almost every week, tbh. [#] - Me (Spain), Vesith (Finland), Diego (Spain), Rollen (Lithuania) *. We are 3 dudes confirmed so far, 4th one might be on the way, it's composed by ex-CSS and CSGO players which were at some good level, so we wouldnt have much trouble to play 0A. Also, if LAN has some 4v4 0A war and just has 3 members I'd join up with them to play that 0A match, too. [#] will be just playing 0A matches since we dont have time to train ATDM for these games, but might be able to accept ATDM clanwars in next christmas or even next summer. If this turns out good and ends up being a weekly thing, I think each week should be on a different server with a different game to keep things fresh. You have to earn your credits, every player starts off with 0. Anax has set his server to new ANNA so we can test/troubleshoot game performance - also me and dani feel that our bullets hit where we shoot them with ANNA. In general, the main focus so far since June has been to have daily games, and that has been a success. We are playing atdm every day for something like 2 months and counting. Games should last throughout August at least, still. 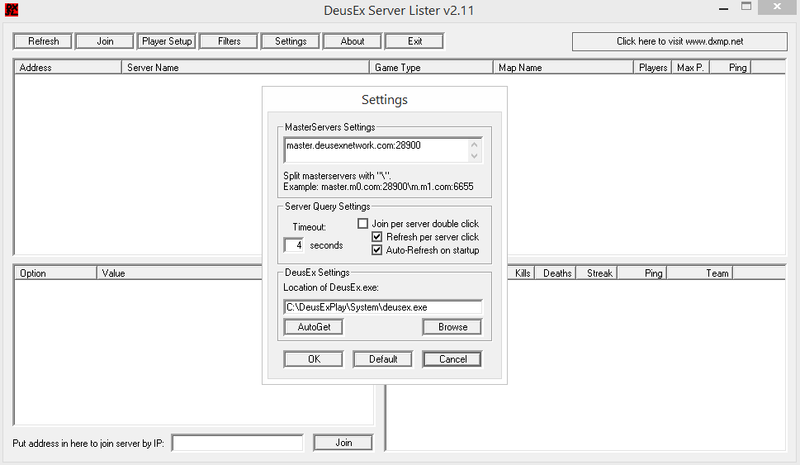 Best way to join in for games when they start is Discord, but there is also http://deusexnetwork.com/serverlist and-or the server notification program dejavu once coded. All these options are better than hoping to randomly come across a game, although we definitely are playing euro prime time hours. synthetic wrote: Anax has set his server to new ANNA so we can test/troubleshoot game performance - also me and dani feel that our bullets hit where we shoot them with ANNA. I wanted to use DXSL again recently but couldn't find it anywhere, so Kai gave me the version he uses. IDK what the rules are about posting downloads of programs, but it's a freely available thing that almost everyone here knows about anyway, if theres an issue just tell me and ill take it off. Or Nobody could make a sticky (Please!! !111 ) with a download to a better or standard release of it that probably exists but I was lazy to discover. Change the address to deusexnetwork.com, click Browse to find your Deus Ex exe, so DXSL can talk to the program. The default one works fine if you don't have a different deus ex folder for playing, (I use the regular one for scripting and mapping). atrey65789 wrote: If this turns out good and ends up being a weekly thing, I think each week should be on a different server with a different game to keep things fresh. I think quarterly would be better. I missed this one because my computer and several other items were stolen from me. I think my roommate was involved But I'm back on my feet with a new machine in a new house by myself. Sorry about the rant. The DXMP Discord server has been growing up a lot and will keep growing up! We gathered some veterans and we are having daily games, some of them with even +7 players! We are doing it not weekly but almost daily nowadays, so it's pretty much a success, we are working on bringing more people back to the game, and so far it's working quite well. Players like Spaz, Silentscope or Sidewinder are having games too!